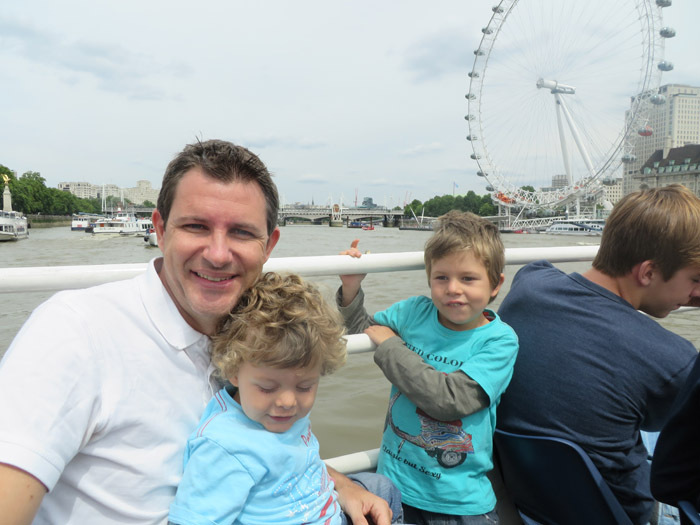 We took the kids to lots of different place in London but the three most popular ones were the Science museum, the Natural History Museum and a River Cruise. 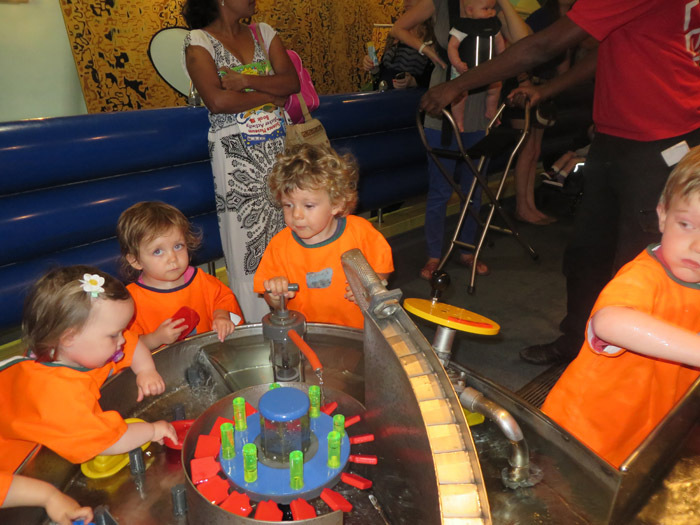 The Science Museum is located next to the Natural history museum in South Kensington (very close to the south side of Hyde Park) and has a fabulous inside “garden” for young kids. 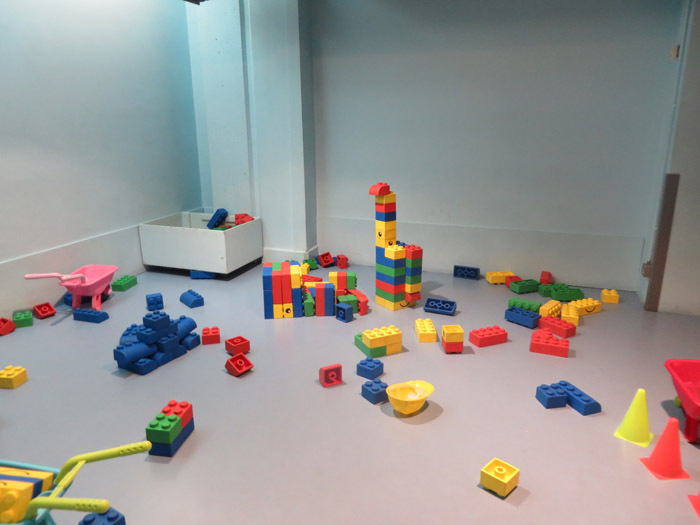 It is a hands on play area for little ones. The museum is excellent. 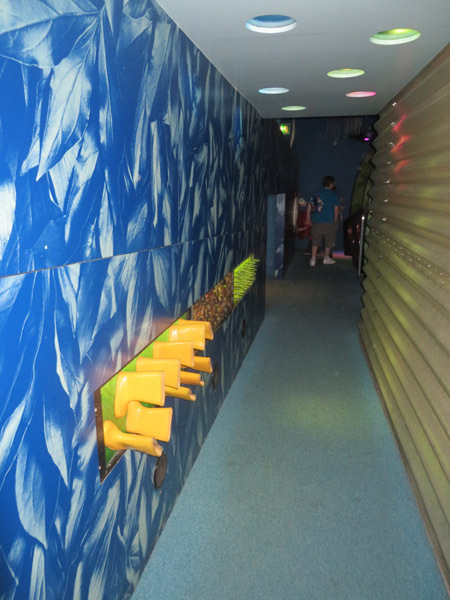 It is really interesting, educational and the exhibits are great, however my favourite part was the basement garden as our kids played for hours while we got to chat by ourselves. We even went with our Friends (Travel with Bender) as it meant that the four adults were able to talk for about 2 hours withouth interruptions while the kids played happily. 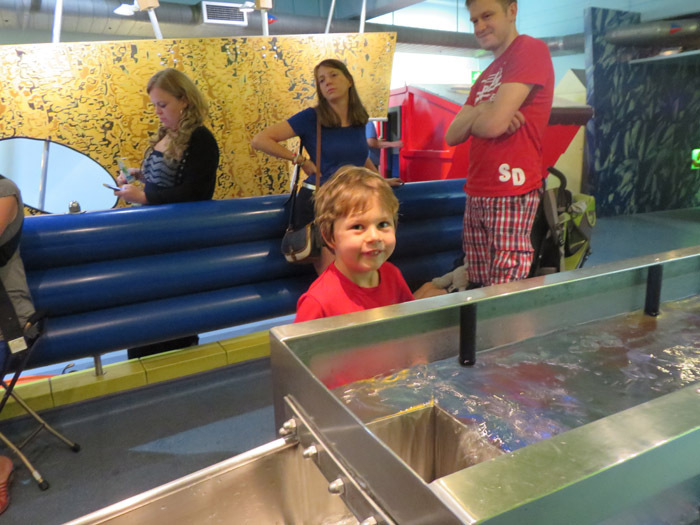 The interactive water area provides waterproof outfits for kids if you didn’t want them to get wet. 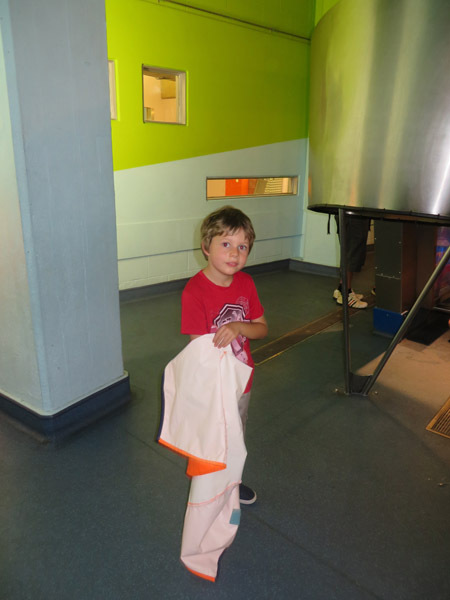 Milo played for hours, pushing buttons, spinning wheels, filling up buckets and watching the mechanics of the machines. They have a wide range of costumes for kids to use. 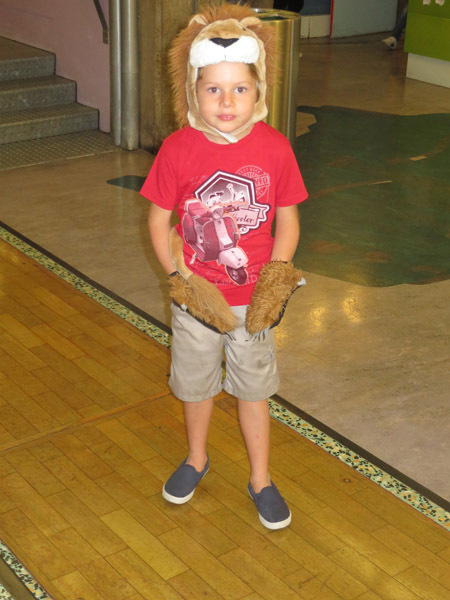 Tom has not really been into dressing up before now and he surprised us by running out dressed like this! 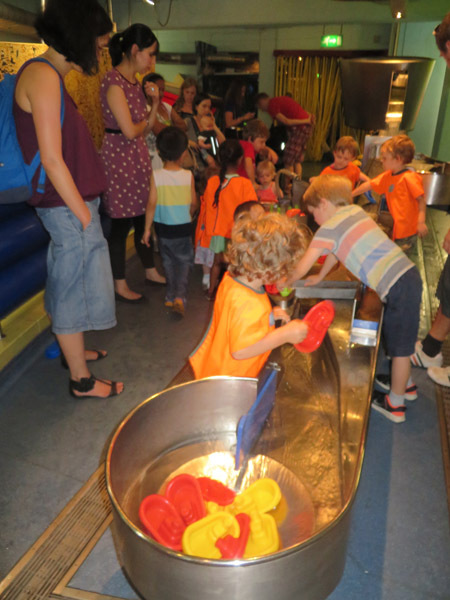 There are huge sensory areas where kids can play with lots of different mediums to make music, noise and create responses. 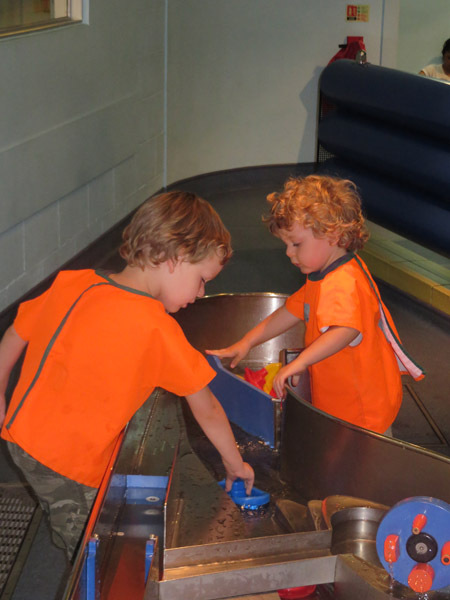 Milo and Caius playing happily together = more time for chatting for the mum’s and dads! 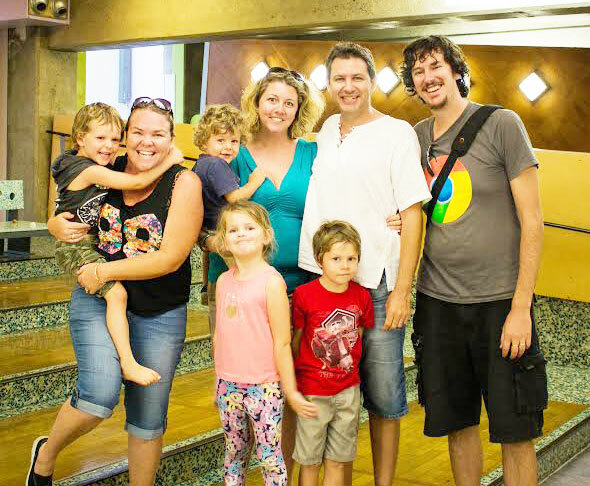 A photo from our catch up with Erin and Josh from Travel with Bender. 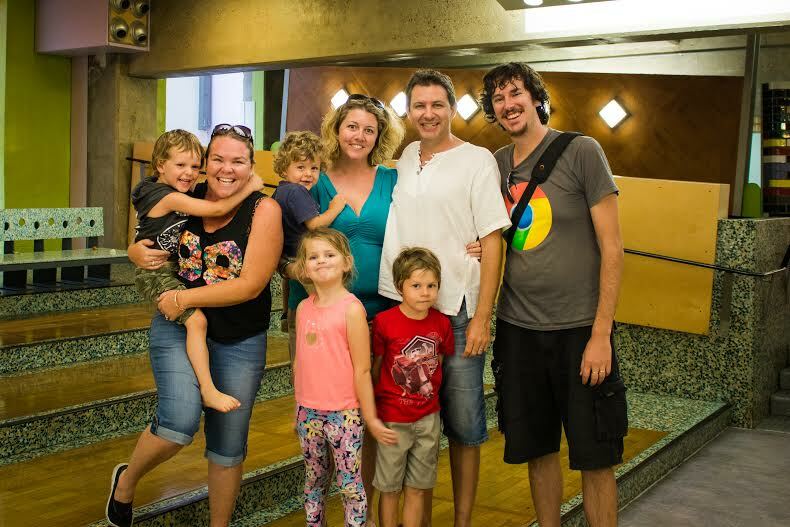 They are seriously cool and have been travelling the world for over 2 years with their little ones. The kids all got along really well and because there was so much entertainment for them and we got to chat for a few hours! 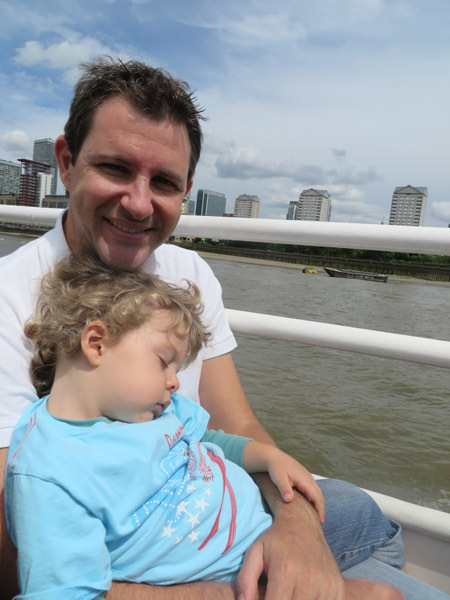 A couple of days later we took the kids on a river cruise from Westminster to Greenwich. It was absolutely fabulous. The boat was very large and had lots of space to sit down. The tour guide was hilarious. My favourite line from the day was “And on the right we have a large old building with an overpriced restaurant on the top floor and unaffordable accommodation bellow” We laughed the whole way and it was definitely true. 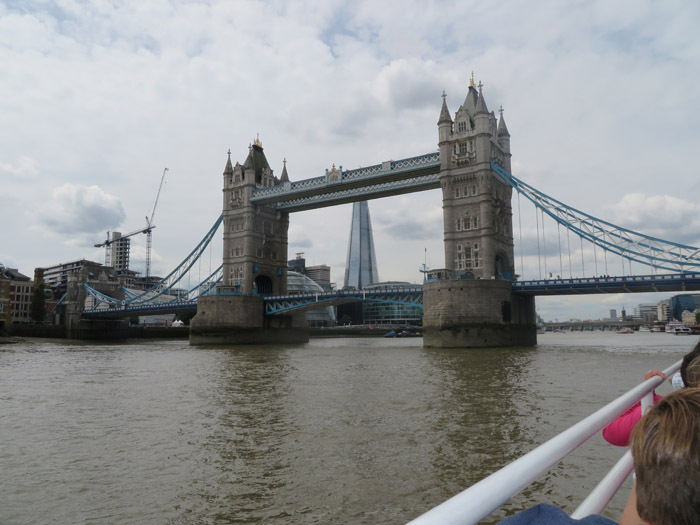 The company we went with was called Thamesclippers and I can highly recommend. It was the first tour that we have been on in a while that didn’t just point out landmarks and actually gave little bits of real, funny and useful information along the way. The boys loved the big ferris wheel. We had planned to go but it was cloudy so we thought we would try on another day and ended up missing out! Oh well. We will possibly be back in London next year, so we can go then! 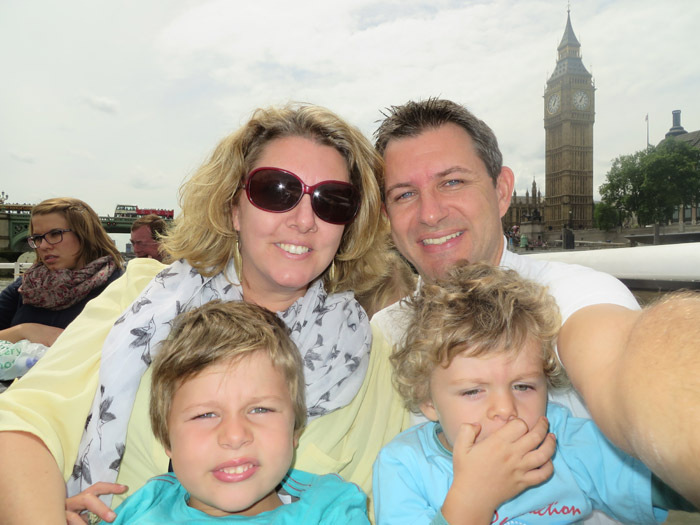 Not sure how we managed to pull off a family selfie with Big Ben in the Background! The tour was a bit too much for Milo. He is having a hard time staying away through lots of things at the moment. 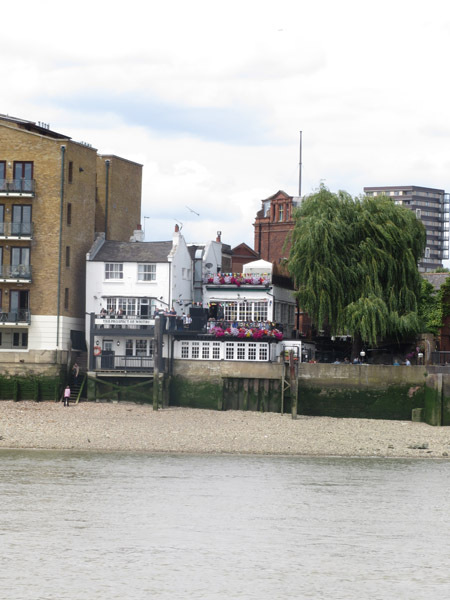 The river cruise ended in Greenwich where we hoped out and explored the old town for a few hours. The Greenwich markets are very famous and very old. They have a lot of up and coming artists and designers exhibiting their work and there is a wonderful food section which is great for lunches or food on the go. We walked up to the common and found a huge children’s park in the North West corner. 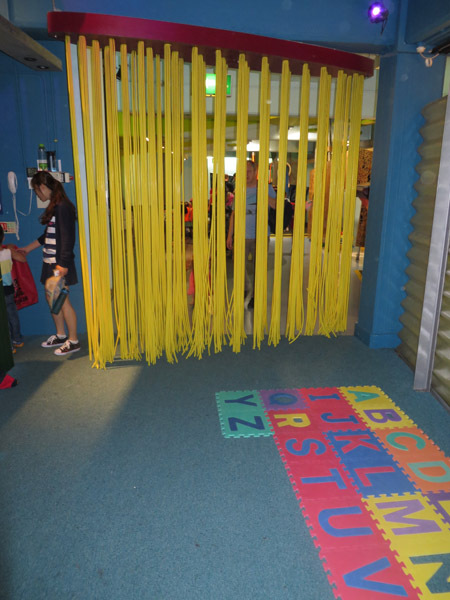 It is gated and has LOADS of play equipment and activities for kids. More importantly there are LOADS of park benches for all the mums and dads. There is a small kiosk that sells ice-cream and cool drinks as well. We also took the kids to the Natural History Museum. I just didn’t get around to taking photos. It is a beautiful museum (South Kensington) and my favourite part is the giant Dinosaur skeleton in the entrance (I think it is a Brontosaurus). Milo fell asleep (again) so we wandered around with Tom and tried to soak in as much as possible. Whilst having a cup of tea in the cafe a girl sat next to me and I couldn’t work out where I knew her from. Turns out it was Venus Williams LOL. She had been playing at Wimbledon and decided to explore London. For the record she is super tall! I felt like a midget! We had a great time exploring London. There is so much to see and do. We are travelling very slowly and not trying to do to much each day. We are finding that if we have a good amount of downtime at home where the kids can play on their own, wander around the gardens, watch TV or do some homeschooling, they are a lot happier when we go out. It is all about Balance and we are still finding ours! Entrance to the Science Museum and the Natural History Museum: FREE. 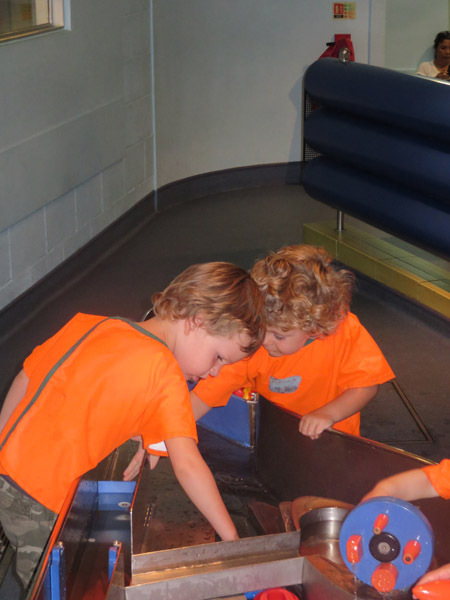 Although some of the exhibits charge. The Dinosaur Exhibit is complimentary. We can’t wait to see you again and Mia is very excited to go to “school” with Tom. So great meeting you all in London. Love the new site! Tom can’t wait! His face lit up when we told him tonight! I am glad you like the new site. We are really happy with it. Lots of little things to add, but that will take a bit longer!